Unique lacy leaf form of the Autumn fern. evergreen clump boasts lacily-cut, dark green foliage that emerges cinnamon-red. 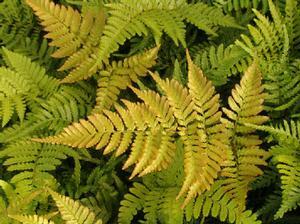 In humid climates, the fronds will produce new plantlets along the edges of the leaves...very cool!